Europe's largest energy firm, E.On, has reported an 18% rise in quarterly profits after revenue growth in Italy and Spain offset a decline in the UK. E.On made a net profit of 2.5bn euros ($3.4bn; £2.2bn) in January to March, up from 2.1bn euros last year. 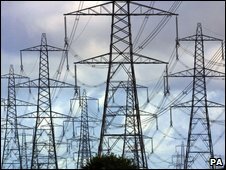 The German firm said that while it was lifted by the opening of new power stations in Italy and Spain, the recession had hit UK electricity usage. E.On's UK electricity sales fell 8% compared to the same period last year. It said that while "the economic downturn had an adverse impact" on its its electricity business across Western Europe, this was "particularly" the case in the UK as firms used less power. E.On's group-wide sales of both electricity and gas rose 14% to 26bn euros in the January to March period, but its results fell short of market expectations. The firm said it was now continuing talks to buy a 25% stake in a Russian gas field from Russia's state-owned Gazprom. E.On said it hoped its full-year profits for 2009 would be ahead of 2008, but that it was difficult to make predictions in the current economic climate.